I would have posted this sooner, but I returned from New York to a sick child and then got a head cold. Ugh. Still, I wanted to share some of the highlights of the 14th annual Society for Children Book Writers and Illustrators Winter Conference in New York City. First, if you write or illustrate, you should be a part of this group. Go ahead, join it now. The group offers local critique groups, and regional and national conferences. This was my second national conference, and I can definitely say the people are the coolest. Really. I attended an educational conference not long ago and one of the big-name speakers was whisked away at the end of her talk, leaving me sputtering a question at her back. Nice, huh? 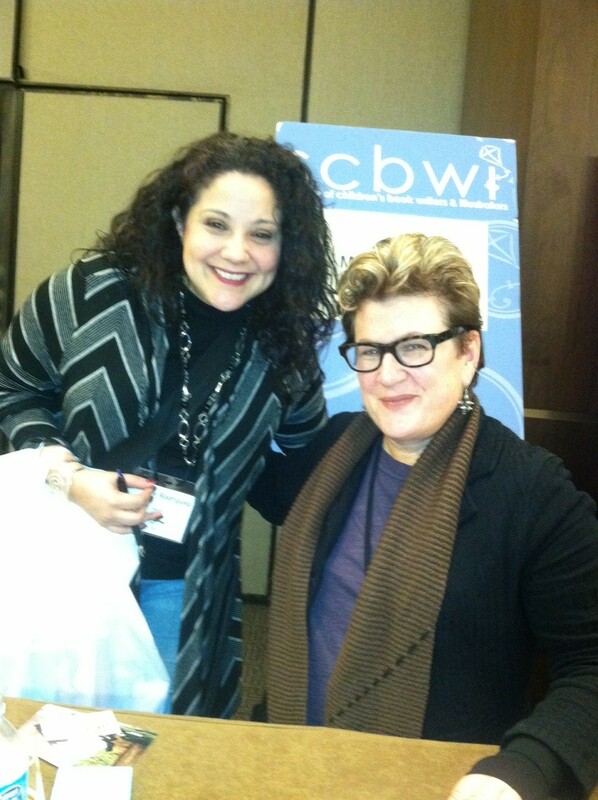 But at the SCBWI conference, I was walking around the evening social, and who was at my regional table? Jane Yolen. 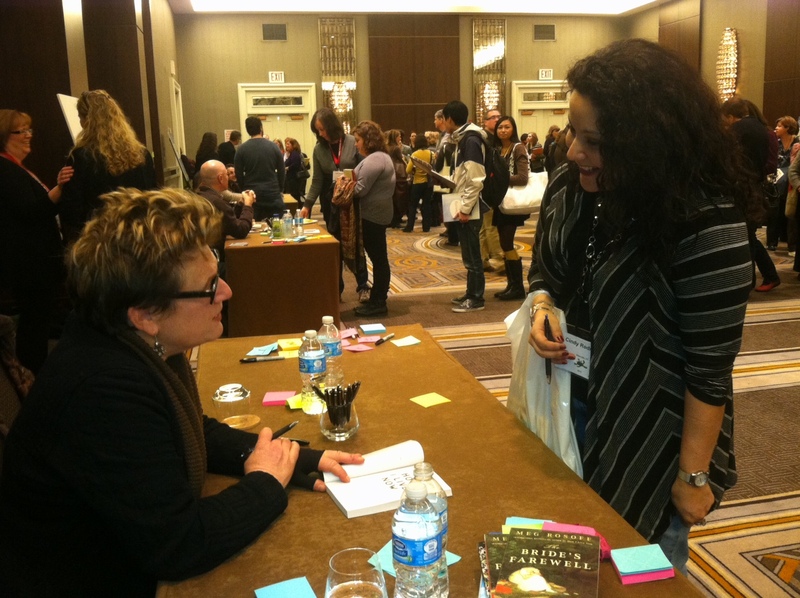 And then a woman I met asked, “Would you take a picture of me and Meg Rosoff? She’s right over there.” How cool is that? The speakers were funny and inspiring. A booksellers panel discussed what’s hot in the market. Meg Rosoff was perfectly snarky when talking about the misconception that writing for children is easy and that “real” authors write for adults. Shaun Tan’s work proved how powerful an image can be and how a story can be told without words, Margaret Peterson Haddix said she’s thrilled that her books appeal to reluctant readers since they are the hardest to reach, Mo Willems encouraged us to dream big. Instead of saying your goal is to publish a book, why not say you want to change the world? And Julie Andrews and her daughter Emma Walton Hamilton were what you’d expect of Mary Poppins and her child: so sweet and engaging. The breakout sessions had a common theme this year, with agents and editors answering the question, “What hooks me?” Molly O’Neil, an editor at Katherine Tegen Books/Harper Collins said she has to fall in love with a project since, if acquired, she’d spend more than a year–at least– on it, reading it multiple times and considering everything from cover art to the marketing campaign. She works on all types of children’s books, from picture books, to middle grade stand-alones, to YA series. Jennifer Besser, publisher at G.P. Putnam’s Sons, an imprint of Penguin Young Readers Group, talked about writing that pops off the page. She read from Rick Riordan’s THE LIGHTNING THIEF, which was her first acquisition as an editor. In the end, the answer to “What hooks me?” was the same: good writing. Each editor had criteria for this, but in general, they know it when they see it. Timing is a major component, too. Vampire books may not get as much attention now post-Twilight, but they’d never say never. The best part of the conference was talking to other writers who are at different stages of the writing-publishing process. Some work full-time and write when they can. Others write full-time. Some have an agent and are on submission, while others are drafting their first novel. What we all have in common is a desire to create stories. Everyone I met was friendly and supportive, regardless of whether they were a beginner or a published author. Again, I say, how cool is that? And finally some photos and a suggestion: if you haven’t attended a writer’s conference, you really should. You leave all warm and fuzzy inside, wanting to throw your hands in the air and shout, “I’m a writer!” Of course, you don’t do this, but you want to. They are that inspiring. 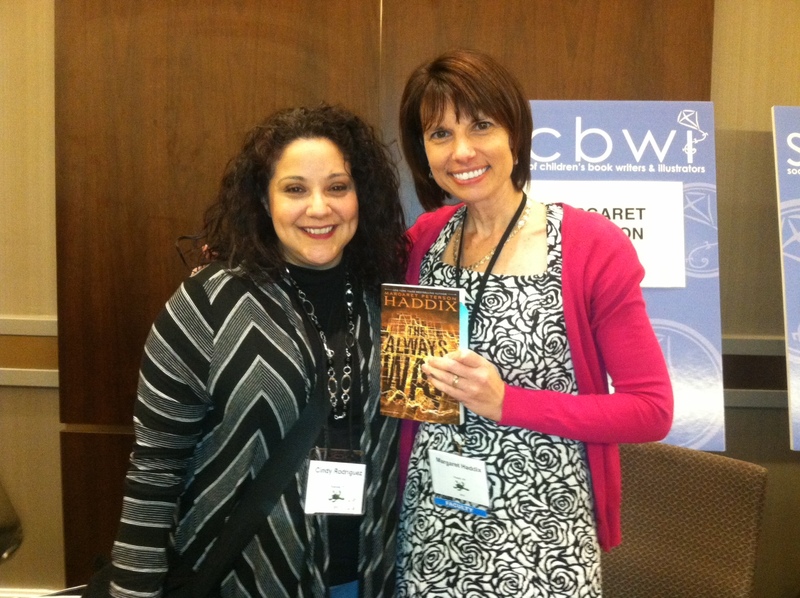 Me and Margaret Peterson Haddix, author of AMONG THE HIDDEN and many other novels.